Several guest researchers visiting us this week! Several guests, that are involved in joint eHealth projects with Åsa Cajander and me, have been visiting us this week. 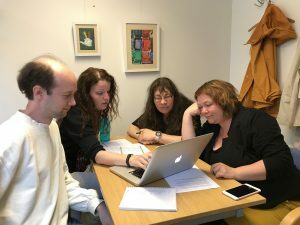 The blog picture was taken yesterday and shows, from left to right, me, Christiane Grünloh (KTH, TH Köln), Gunilla Myreteg (Örebro University) and Maria Hägglund (Karolinska institutet). Christiane Grünloh, who is a Ph.D. student from the Royal Institute of Technology (KTH) and living in Germany, will be with us this entire week to work with us on a large observation/interview/survey study which will be conducted with physicians and nurses at Uppsala University hospital. She is also a member of the HTO group, but is mostly connecting from Germany via Skype. We have been working mostly on refining the interview template, since we have not yet conducted any interviews. Yesterday, Gunilla Myreteg from Örebro University and Maria Hägglund from Karolinska Institutet also joined in to, among other things, help us finalize and pilot the interview template. It was a very productive day – it’s nice to sit down with colleagues you don’t meet that often to really focus on a common task. Those who want to know more about our study at the oncology department, which is a part of the DISA project as well as the larger DOME consortium, can read this blog post for an introduction of the entire research team behind the study and this blog post for an introduction of the different parts of the study. Author Jonas MollPosted on May 18, 2017 Categories DISA, eHealthTags DISA, DOME, Interview, SurveyLeave a comment on Several guest researchers visiting us this week! With 180 exhibitors and a huge number of presenters Vitalis 2017 was indeed vital. For a first time visitor such as myself it really made the impact of e-health on society tangible. The exhibitions gave an understanding of the actors in the field, raging from service designers to robotics. (Plus more espresso than a man could drink, though I tried.) The presentations showcased how the same technology was introduced and effected health care on a many different levels. The combination of exhibition and presentation also created a nice tension between the promises of technology and the sometimes more complicated implementations of the same technology. Given the sheer number of parallell sessions it was impossible to cover more than a few select presentations. The DOME consortium, of which we are a part, had great visibility with a track of its own. Jonas Moll of the HTO-group has written more on this topic. Quite impressive was also the fact that our students had been invited to give their view on the future of health care. Given how professional they were, I would say it looks promising. I also enjoyed the presentation made by Carl Johan Orre from Malmö University on the topic of person centered technology. 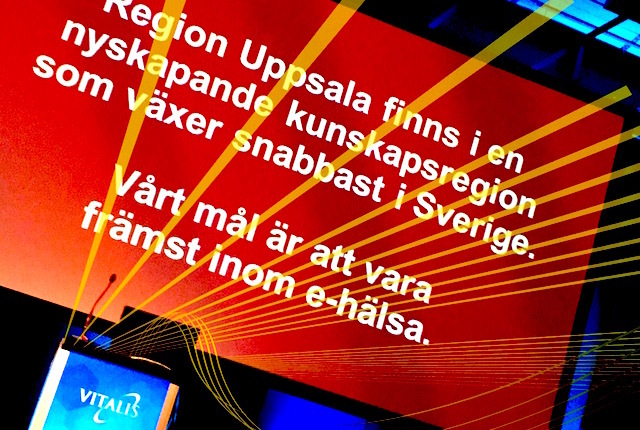 I might be a bit biased but what I found really inspiring was the presentations made by our colleagues from Uppsala University Hospital with whom we are collaborating in a number of projects. Birgitta Wallgren discussed the complexities of large scale implementations in a setting with other ongoing large scale implementations. Annemieke Ålenius and her colleague presented lessons learned from the unplanned and almost week long downtime for the hospital’s patient journal system. While interesting in itself–for instance the comment that soon staff will have no experience of paper based back up routines–they also managed to convey some of the drama from behind the scenes. Still, it was a good thing that the crisis had a happy ending–thanks to a strong group effort from the whole hospital staff. Finally Morten Kildal discussed the various strategic paradigms that have succeeded each other as the solution for health care, including the current concept of value centered care. While no doubt new paradigms will come, Morten Kildal did make a solid case for the benefits of the current strategy–as well as the need for relevant data. In summary all of the three presentations stressed the importance of coordination–between implementations, in crisis or in the patient journey. Yet, what I really found positive for our ongoing collaboration was not only the fact that the presentations were analytical and reflective but that the presenters had a strong humanistic outlook. This also, is promising for the future of eHealth. 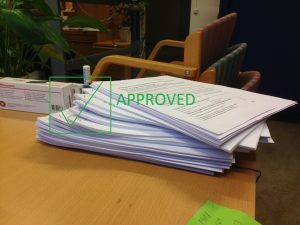 A new eHealth research adventure is about to start! Author Jonas MollPosted on April 5, 2017 Categories DISATags DOME, eHealth, Interview, Medical records online, Observation, SurveyLeave a comment on A new eHealth research adventure is about to start!